A fairly large and well-known village that has some interesting historical features. 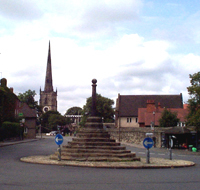 Repton is curiously known as the capital of Mercia, and in St Wystans Church you will find a Saxon crypt that contains the burial place of Mercian Kings, dating from around 750AD, that is one of the most important relics of Saxon architecture in the country. There had been a monastery originally on the site, but although once destroyed by the Danes, the crypt managed to remain intact and eventually the church was built on top. Repton School was founded in 1557, and has continued to build on its solid reputation.